(E, F)The cells were not treated or treated with BIBR1532 before wounds were made. Relative ratio of wound closure per field was shown. (G, H) KrasG12D and KrasG12V-induced migration ability of lung cancer cells was inhibited by BIBR1532 in Transwell invasion assay. Numbers of invasive cells in 10 fields were counted. Magnification: ×200. Representative pictures were shown. Values were the mean of 3 determinations ± SEM (one-way ANOVA, *p < 0.05, **p < 0.01). Cyclogalegenol, the aglycone derivative of astragaloside A, is found in various species of Astragalus and may activate telomerase. Cycloastragenol is a saponin comprising a group of oil glucosides naturally present in a number of plants. 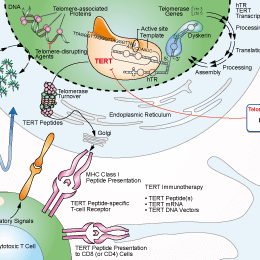 It is a potent telomerase activator in neuronal cells.